Building a multilingual website is the unique experience for the majority of people. It’s not easy to realize such task from the technical point of view as compared to a standard variant that comes in one language only. You’ll need to take care of quality translation (menu, user agreement, automatic e-mails during the registration process etc. ), proper SEO optimization with regard to the local specifications, correct work with coding, additional server space for automatic language definition when getting access to a website. This is too complicated for a newbie. Generally, multilingual websites are created for companies dealing with foreign partners. These may also be translation agencies, travel companies etc. The more bulky the material is, the more complicated the entire process will prove to be as well. However, if you discard the most complicated variants, you’ll need to choose a convenient tool, stay confident and goal-oriented. In this case, it will be quite possible to launch a multilingual website on your own, without any notable experience and financial investments. 1. A Separate Domain, a Subdomain or a Website Section? The most popular and widespread approach is the creation of several language website copies on separate domains, subdomains or in folders with names like .es, .fr, .de. But this approach isn’t a suitable option for the best SEO as Google considers all those subdomains as separate websites. Besides, this way is technically complicated, especially for users with inadequate amount of coding skills. So, it makes sense to create several website folders dedicated to those languages you need for your business development, i.e. website[dot]com/en. 2. Specification of a Separate Language Version for Google (for Automatic Language Detection). When working on the development of your website, you might consider specifying a separate language version for Google. In this case, the search engine will automatically detect the locality, from which users visit your website, automatically offering them suitable language detection. When it comes to the creation of multilingual websites, it makes sense to specify canonical URLs. This is important in case you wish only one certain language page version to be displayed in the search engine results. Translation of meta tags for these pages and their content (images, articles etc.) will also boost the SEO parameters of your multilingual websites. If you decide to make your website multilingual right from the start, make sure to place the language change button on a visible place. Users shouldn’t waste their time looking for this button elsewhere. It should always be at hand. Google doesn’t like web page duplicates. Even worse, their detection may have negative effects on website search engine ranking. The best way to avoid that is to create unique content for each page of your website. Make sure the translations of pages are of high quality. This matters a lot both for the search engine and the users. Not every service will make it possible to create a decent multilingual website. This task can be completed by professional systems only, which come with the required feature sets, design customization tools and SEO parameters. Having explored multiple website builders, we have singled out Wix – the platform that works best for this purpose. Let’s review the peculiarities of multilingual website realization with this cloud website builder. 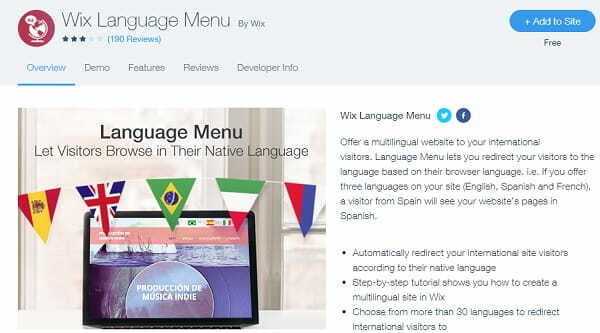 The realization of a multilingual feature with Wix is closely connected with the use of Wix Multilingual application. To start with, you’ll have to duplicate all the website pages for as many times as you need to get the required number of website localizations. Then you’ll have to prepare the translations of all the pages to remove the stock website menu afterwards (this is an obligatory step). Now, you have to create a menu consisting of buttons (there is such a widget here) and connect the links to website pages to it. Header display option (connection) should be disabled at all the pages, because the manu may disappear from all the pages except for the homepage during the language change. You can also set up buttons design in the “Language Picker” section to change the language (name, background, measures, splitter, font). If you have done everything right, you’ll get a convenient multilingual website. What matters most is quality translation of website pages. Each time you add a new page, you’ll need to duplicate it with its translation and set it up in Wix Multilingual, following the first four steps provided in the instruction. Yes, it’s not quite convenient, but it’s not difficult as well. Just do it once and you won’t need an instruction to repeat the process again. This is quite a normal variant. You don’t have to edit any codes here. This is the best option for a commerce website. Wix Website Builder Review – see Wix review for more details. Multilingual websites are not uncommon nowadays. Some people use the multilingual localization to highlight the reputability of their company or activity without any practical necessity. This is also a nice option, so, why not? For the majority of users, though, a multilingual website is a nice way to expand the business audience, attract user attention and get more profit. It’s not easy to create such a website, but this task can quickly be solved even by newbies. Wix users, who wish to attract the attention of the foreign audience, will be able to do that by means of a brand system app. If you have ever used this website builder to launch a multilingual website, you should be definitely satisfied with the result. This is because it doesn’t take much time and effort to expand to multilingual localizations here. If you are right about to do that, then Wix will work best for this purpose. It is simple, understandable and affordable.